We’ve created a monster! Our very own Jamie Orr has become something of an Internet sensation seemingly over night and producing show cars like this new Jetta in record time, it’s hardly surprising! Words: Tony Saggu. Photos: VW & Jamie Orr. SEMA PROJECT Contributor Jamie Orr takes on his most important challenge yet! For the most part I’m not a huge fan of all those TV shows, Internet blogs, YouTube channels and the like, where some bloke and his mates try to “entertain” me with their outlandish car exploits. Honestly, I couldn’t care less about how you turned a Corsa into a caravan or made your Ferrari float or fly. Cutting up and crashing cars just to show us how big and clever you are isn’t, in my book, quality entertainment, and having seen some of these “pimped” and “rescued” rides in the flesh, they’re not a display of talent or skill either. Don’t get me wrong, I was the first to cheer when custom cars and modded rides hit the mainstream; hot rods on the telly, lowriders at the pictures and the Internet showing us a brave new world of rad rides and modified motors. Unfortunately it all turned pear shaped and went south in a hurry, before you knew it media manufactured clueless muppets and so-called streetwise svengalis were telling us how to play our game, hopeless hipsters were hopping on our hobby to make a quick buck or sell us out for the ratings... art, creativity, passion and vision were all just so much collateral damage, lost in the ego stroking money making mix. It’s all made me suspicious of those TV types and their automotive agendas, surely there must be someone building cars in front of a camera who still gives a damn, a likeminded car crafter who didn’t just buy into the hobby for likes and followers, a fellow fettler who can entertain, educate and still build righteous rides we can respect. Well, as luck would have it, a few years ago we bumped into such a character, a soft spoken Scot with deep Dub roots living in deepest Pennsylvania (USA) whose rides displayed taste, talent and a tendency to be more than a little unusual. Jamie Orr, despite his amiable attitude and mellow demeanour is not like most of us... actually he’s not like any of us. While most of us waste a weekend or two now and again slowly persuading our projects along, loitering by the lift or jousting with the jackstands, throwing a few week's wages at a pile of scrap and shiny parts that seemed like a good idea at the time, Jamie’s perfected the thing into a science. When it comes to VW and Audi shenanigans, if it’s probably not a good idea, might cost too much, will definitely take too long or never get done, and there’s a fairly good chance of injury or incarceration... then Jamie is your man. Simple car enthusiast or mere motor makeover merchant just doesn’t cover it, it’s like calling Anthony Bourdain simply a chef or David Attenborough a mere naturalist, Jamie’s an automotive adventurer; he’ll build you a car, but not before he’s taken you on a wild and wonderful journey... and filmed the whole thing and stuck it on the Internet. Despite already having a day job, being the man behind Orchid Euro, importers and suppliers of rare and unusual cars and parts from Europe to the States, Jamie’s extracurricular activities have made him more worthy of TV time than most of the car centric rubbish rated as viewable at the moment. Did you hear about the bloke who drove over two thousand miles from Pennsylvania to Mexico to swap a Chevy van for a rare old VW bus, got held at gunpoint by the Cartels before escaping and driving the old banger back... before it blew up in the middle of nowhere, or the fella that travelled hours in his rare VW Doka to help out an Argentinean family who had broken down on the freeway in their VW Bus while on their way to visit the Pope? Surely you’ve heard the one about the loon that drove a Mk2 Jetta limo 2500 miles in 31 hours just to prove he could, then randomly found the famous 1999 Empi VW Beetle in some lady’s garage, threw a new gearbox in it on the side of the street and drove the thing coast to coast...then all the way to Worthersee... yeah that was Jamie. Whether it’s flying to South Africa, bolting a VR6 into a Mk1 Citi Golf and driving half way around the world in it, or popping over to Spain to pick up an Audi Hearse to drive on the Nurburgring and then over to Vegas, the man has done and documented feats that you just can’t make up (it is a bit bonkers when you put it like that – Ed). Mr Orr’s latest adventure, while it didn’t involve perilous driving, the Police or indeed the Pontiff, still serves up a tale of thrills, spills and a pretty spectacular ending. The new 2019 Jetta was something that Jamie had had his eye on for a while, having been given the inside track by his mates at the VW factory long before most of us saw the grainy spy shots on the Net. True to form in early September of 2018, with the factory paint barely dry on it, Jamie had one in his garage with plans to tinker with it. 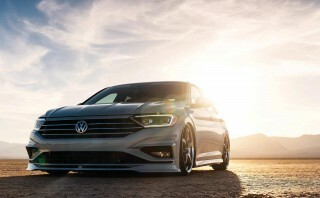 The Wolfsburg suits had also let slip that they intended to have three examples of the their new model at the SEMA show in Vegas, the plan was to pick three respected tuners and give them a free hand in modifying the cars any way they wished, the idea being to show prospective buyers the potential wrapped up in their new offering. Needless to say, Jamie put his hand up for the challenge, after all it was right up his street; SEMA was a mere six weeks away, there were pretty much no aftermarket parts available yet for the 2019 models, and he would be up against the likes of Air Design USA and H&R at the world’s biggest tuning show ... no pressure. The stock “S” trim suspension would be the first part to go under the knife, while a healthy drop was a must; Jamie wanted a car that would be completely functional with a smooth ride and sensible suspension travel. “KW supplied possibly the craziest race parts available,” he enthused, “Glen and the team simply asked me for the ride height that I wanted, and they built a set of insane Clubsport coilovers, with three-way adjustability, remote fluid reservoirs and camber plates.” The results, you’ll have to agree, are pretty stunning, even though the sedan appears to be set up on switches, the subterranean slam is static all the way, and with plans to have the car at shows across the States and a drive over to Worthersee 2019 on the cards its freeway friendly and totally practical too. The rapidly draining hourglass made for frantic cabin capers too; “Recaro USA weren’t able to supply the seats that I initially wanted in the time frame,” Jamie told us, “so I borrowed a set of A8s from another of my cars, which had been previously trimmed by Kip Love in retro VW Houndstooth material and took the rear seats from the pre-production car to a local mattress manufacturer, Magic Sleeper, to be trimmed to match. They make custom mattresses and happen to make them for VW buses, so they had the skills and machines to do it in record time.” The VW Accessories team sent out a few choice upgrades like the pedal covers, boot liner and an official VW iPhone lightning cable. “The neatest nerd VW products were the magnetic rear window shades which I’m genuinely stoked on,” smiled Jamie. Black Forest Industries have a history of making a one-off custom shift knob for Jamie’s bigger projects and they came through again, also throwing in the first shift boot for the new Jetta which will be available to order shortly. “One of my favourite small details is the colour matched Marin Gestalt X11 bicycle that became part of the project,” enthused Jamie. “Their factory produced literally one of these awesome bicycles in the VW white-silver paint which was then shipped express to me in order to make it in time.” Being an avid cyclist Jamie had a set of roof bars that the VW Accessories team had sent out chopped and lowered by local friends Bobby at Dominion and Dan Yost. Sadly the bars weren’t ready in time for the bike to be part of the photoshoot, but it did make SEMA and can be seen in the shot above. Definitely shades of the Mk3 Jetta Trek edition VW offered in the 90’s. Needless to say the car was a huge success at SEMA and will be on display literally all over the world in the coming months. Further custom touches and upgrades are in the works as with most of Jamie's projects, and we’ve got a feeling that the stock 1.4 TSIO motor shouldn’t get too comfy between the fenders as swapped powerplants are something of a trademark for Mr. Orr. If this display of adequate to awesome is what the man can do in six weeks and given his history of “hold my beer” exploits in the past, then we’ll be hitting the Subscribe button on the Net for future instalments and maybe tuning in on the telly ... TV executives take note.